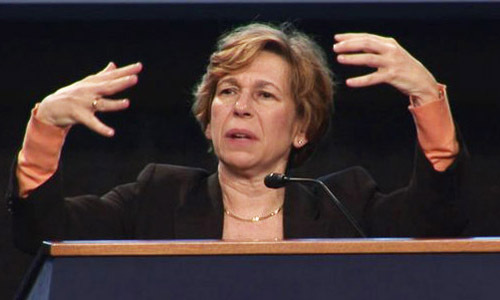 American Federation of Teachers (AFT) President Randi Weingarten, who sold out teachers in Newark, Baltimore, New Haven and other cities but was unable to do the work of corporate school reform against Chicago.At the time the Newark agreement gave bragging rights to Republican governor Chris Christie for making New Jersey the first state in the Union to base teacher pay on student test scores and on a teacher evaluation scheme that was nothing more than a Christie promise when Weingarten signed off on it. �A lot of people feel a huge sense of betrayal,� Weingarten said. . . �You made a promise to act differently, and you have instead acted exactly the same,� she said of Christie. Classic Weingarten, who knows more about betrayal than she is willing to admit. > Since she was "made" by Mike Bloomberg in 2009 for her fealty to corporate education reform when she was the head of UFT, she has not disappointed those who view the role of the union as a rubberstamp for Business Roundtable initiatives. > While many hard working teachers who pay Randi's way resent the fact that she is paid more in salary and benefits than the President of the United States, she has been worth every penny in terms of her return for CorpEd. The head of the country�s second-largest teachers union and a business leader who tried to weaken unions as a onetime governor of Michigan have made a joint plea to the nation�s governors to stand by the controversial Common Core academic standards. Randi Weingarten, president of the American Federation of Teachers, and John Engler, who leads the Business Roundtable and served as Michigan governor from 1991 to 2003, have written to governors in 45 states � as well as the mayor of the District of Columbia � that have fully adopted the new K-12 math and reading standards. Weingarten and Engler urged the governors to �get it right� by giving educators time and support as they make wholesale changes in the way they teach and to hold off on testing students on the new standards until schools have fully implemented new curricula based on the standards. And the pair asked the governors to stand behind the Common Core standards in the face of a growing backlash from critics on the right, the left and in academia. > [Note that WaPo's Layton could have used many terms other than the marginalizing elitist label, "academia"--she could used "reality-based educators and parents," "researchers," "educational leaders."] > �We ask you to stay the course and oppose attempts to impede the successful implementation of the Common Core State Standards,� Weingarten and Engler wrote in their Nov. 26 letter to the governors. None of the governors responded. �This came from the bottom up, this didn�t come out of Washington,� said Engler, who called the standards an �economic and moral imperative.� > Bottom up? Written by governors and state education officials?? Really? Where did WaPo get this idea? Not out of Washington? So remember � the next time that Weingarten comes to your town with her bullhorn and satin handcuffs, along with her posse of fellow lawyers trained in obfuscation and the art of the diplomatic lie, and her well-rehearsed expressions of solidarity with parents, children, and teachers, I hope that you will ask her which of the policies that she now protests are ones that she did not support at some point in the very recent past, or even the present, or even the future--if we can just get it right. Randi Weingarten deserves nothing less than our full and enthusiastic support for her immediate replacement. If not immediate, then very soon. From what I am hearing, leaders of the National Education Association have already heard the pounding of footsteps as teachers approach the front gates. Dennis Van Roekel is rumored to soon be history, another discarded relic of betrayal, deceit, and corruption by leaders who have sold teachers down the river. AFT should do the same, unless the AFT leadership feels teacher revolt is preferable to a smooth transition. > Seems to me it's time to choose, and those who refuse to choose have by doing nothing, demonstrated their choice. Below you will find a YouTube video of David Coleman from 2011 talking in circles about Common Core. The most impressive part comes in the first 20 minutes, following his introduction of the University of Pittsburgh's most famous corporate academic, Lauren Resnick. In these first few minutes, Coleman appears to delight in his lack of qualifications or preparedness for the coup that he is just pulled off.